Shattered Grove circa 2E 582. 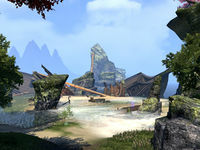 Shattered Grove is a little sleepy town located in central Auridon, over the western hills of Calambar, west of Skywatch, northwest of Mathiisen and south of Dawnbreak. Shattered Grove is located in a heavily forested and hilly area of eastern Calambar. The unwalled settlement lies in the middle of exotic and paradisiacal woods. Vast deciduous forests of laurel, maple, and larch trees grant the land a lush but unkempt appearance. Along the boundless tracts of unspoiled wilderness, wild bears and wolves hunt, along with gemlike arachnids. The jagged cliffs of white granite to the east face Summerset Isle are treacherous and made more than one ship wreck, but this coasts also offer some secluded coves. It is unknown when Shattered Grove was exactly founded as a settlement. 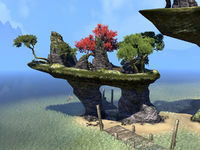 It could have been as early as the Middle Merethic Era, when Torinaan first landed in Auridon, to as late as the Second Era, when Shattered Grove was a well-established Altmer settlement. However, the magic stone monoliths appears to have always been in the woods around the town and nobody knows who and when erected them. 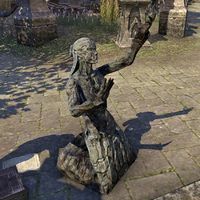 Merormo was an Altmer wizard from the Skywatch Mages Guild who were no longer welcome to the place and was dismissed by Telenger the Artificer due to many ill-fated and dangerous experiments. He exiled himself to Shattered Grove and built a tower of his own in the middle of the woods to continue his works during the mid-Second Era. In 2E 582, animals around Shattered Grove suddenly turned aggressive and the villagers were literally petrified. Merormo reveals to the Soulless One that he turned the villagers to stone to protect them from the animals, who he believes to have become possessed by a powerful Daedra, who is using the monoliths in the woods. Direct manipulation of the monoliths did not work. After capturing one of the bears, Merormo attempted to banish the Daedra, and instead, the bear burnt down and turned into a flame atronach. In a nearby cave, the Soulless One discovered Akata, a powerful Dremora, responsible for the corruption of the wildlife near Shattered Grove and originally summoned by Merormo to create an army, and killed her, ending the Daedric influence over the town. Merormo original purpose was use his Daedra army to end the Three Banners War or, at least, allow his nephew, who has been sent to the front lines, return home. After being forced to restore the villagers, the wizard was captured and was put to trial by the Canonreeve. The final fate of Merormo is unknown. By the Second Era, Shattered Grove have been shrinking slowly, losing villagers from time to time. Specially, after Merormo moved to the town and began his experiments. It is unknown if the town was still in existence during the Tiber Wars or the Imperial Simulacrum. Shattered Grove has been an integral part of the realm of the Summerset Isles since its foundation. A Canonreeve is tasked to rule the settlement. In the secluded coves and beaches between the cliffs of the western coast, smuggling operations are known to be made by the locals. The town provides very few services and is little more than a village, with a local smith, and a few villagers, looking for a secluded and calm site to live. Local fauna is known across Auridon to be very friendly towards people, from critters to bears due to the influence of an unknown kind of nature magic of these woods, channeled through various stone monoliths. The animals even let the outsiders pet or feed them. Both commoner and noble Altmer appreciate the hunting Shattered Grove provided, due to the characteristic behavior of the animals from those forests. However, Shattered Grove is also considered by the nobles as nothing more than an horrible backwater village.